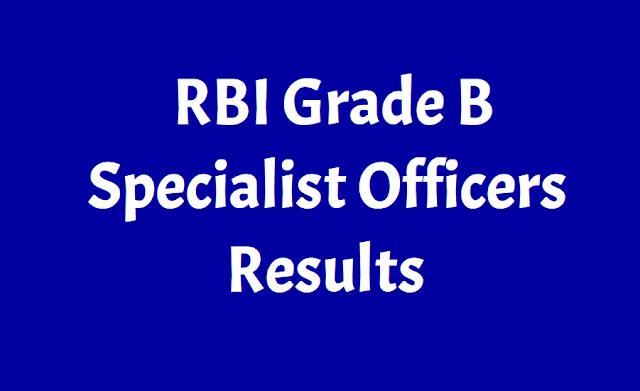 RBI Grade B Specialist Officers Results 2018: Reserve Bank of India (RBI) has declared the written exam result for Specialist Officer (Grade B) Posts. Candidates who have appeared in the examination can visit the official site of RBI at rbi.org.in and check their respective results. The examination was conducted on September 29, 2018, for the Specialist Officer post. This examination will fill up 60 Specialist Officers in the Bank. Candidates who will qualify the examination will have to appear for the interview to be conducted by the Board. The interview schedule will be intimated to the candidates later. Step 1: Visit the official site of RBI at rbi.org.in. Step 2: Click on the Opportunities section given below. Step 3: Click on Results section available on the top of the Opportunities page. Step 5: The pdf file is there to download. Step 6: Download the PDF file and keep it for further need.